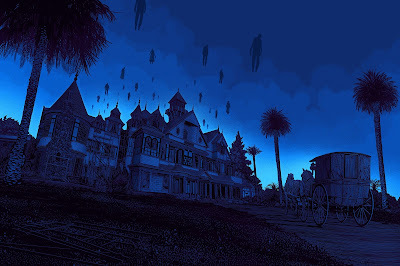 Earlier this year, Daniel Danger was invited by the production staff of the Winchester motion picture to visit the famous Winchester Mystery House, a sprawling maze of a mansion claimed to be one of the most haunted places in the United States. As part of that trip, Danger commissioned to create a killer movie poster screen print for the film that could only be won by lucky fans, and would never be put on sale. However, Daniel did get to release a very limited art print of his Winchester Mystery House design, which went on sale earlier this week at the Danger online store. Sadly this epic poster sold out almost immediately upon release. The Winchester Mystery House Art Print by Daniel Danger is a 24”x36” signed and numbered 7 color screen print, and retailed for $60.